As important as training is, providing companion dogs with experiences and enrichment will ensure that their behavioural needs are met. With modern living and choosing and sourcing of dogs, pet dogs are often kept in inappropriate environments, socially isolated and without sufficient access to appropriate stimulation, especially olfaction. This adversely affects their welfare, which will lead to problem behaviour. Many approaches to dealing with this that are marketed to pet owners are just not appropriate and, in our experience, may lead to many and more serious issues. 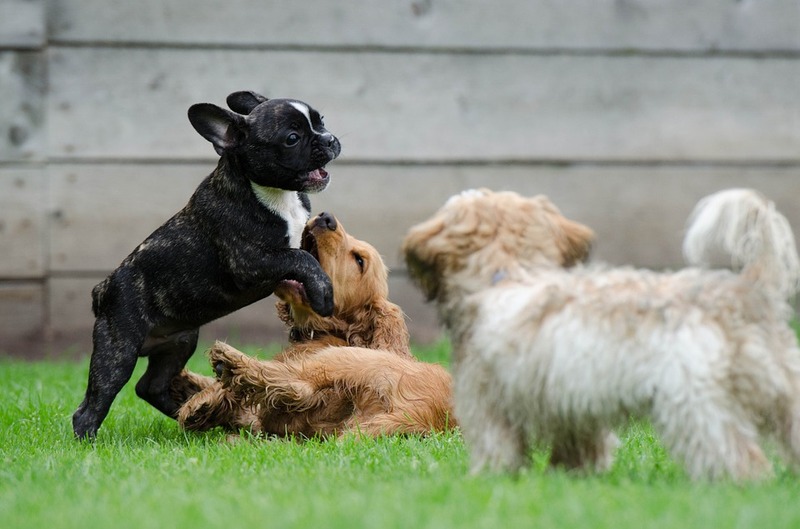 Your dog will not experience highs in arousal that cause the development and rehearsal of inappropriate behaviour and are so commonly associated with lots of group approaches to dog-dog play, running wild and repetitive fetch games. Although this may result in an exhausted dog, it does nothing to improve behavioural health; all our Train, Play & Learn services aim to maximise appropriate behavioural development. We can help you and your dog, by coming to your home, to help you help your dog meet those needs, providing appropriate entertainment, exercise and stimulation. Why not let us put training exercises in place so that you can enjoy your dog’s behaviour?! We will come to your home and work on training with your dog in the house and out & about, while you work, rest or play! We will record our sessions and send you instructional videos so that you can practice at home. Daytraining starts with a one hour information session, in your home or via Skype. We will gather information about your and your dog’s training requirements and build a program based on that. We will implement the program, starting with the foundations, and build to bringing our training on the road. At the end of the course, we will have one private handover session with you to help you implement this work at home and in your life, so that you and your dog are on the same page. This works best for loose leash walking and we have had great success with a range of dogs with this service. Where required further daytraining sessions may be required to achieve the desired results. We will discuss this with you as we progress through the program. All packages must be booked and paid for before the first session or according to the pre-agreed payment plan. Sessions must be booked and completed within a specified timeframe. Would you like your dog and his or her buddy have some play time with our seasoned behaviour experts teaching you how to supervise their play, and train through fun? Supervised Play Sessions are 60 minute sessions at your home or chosen, appropriate location for two-four dogs, and at least one handler/pet owner with our trainer, providing instruction on active play supervision and recognising appropriate and inappropriate play behaviour. Not only fun, but super-educational for both ends of the leash! Each session costs €70 per handler. We want to help you make your dog's day more dog! Modern dogs live the least natural and preferred life that dogs have ever lived. To maintain their dog’s welfare, pet owners might need help to make sure that their dog has sufficient outlets for natural dog behaviour. Doing this is beneficial to both ends of the lead - a dog who has appropriate outlets for being a dog will be less likely to demonstrate problem behaviour, and will be happier & healthier. Everybody wins! training & enrichment adventures – adding some structure, engagement and appropriate activities to walks will give you and your dog a new leash on life and outings together! We will go on an outing with you,and your dog, and show you how to inject more structure, enrichment, training exercises & engagement, excitement & calming, and lots and lots of sniffing. If walking isn't what’s needed, we will help you construct appropriate adventures that will provide your dog with appropriate outlets for their behaviour to ensure their health and well-being. These, usually, one-off sessions will give you expert and individualised guidance so that you can make sure your dog will be truly happy and content, provide improvements in welfare and therefore behaviour. The 90 minute session at your home or appropriate location costs €100.